In the past few weeks I received several calls asking a version of the following question: how are stand, tillering and panicle size related to yield? A way to understand how these things interact is by discussing rice yield components and the factors that affect them. 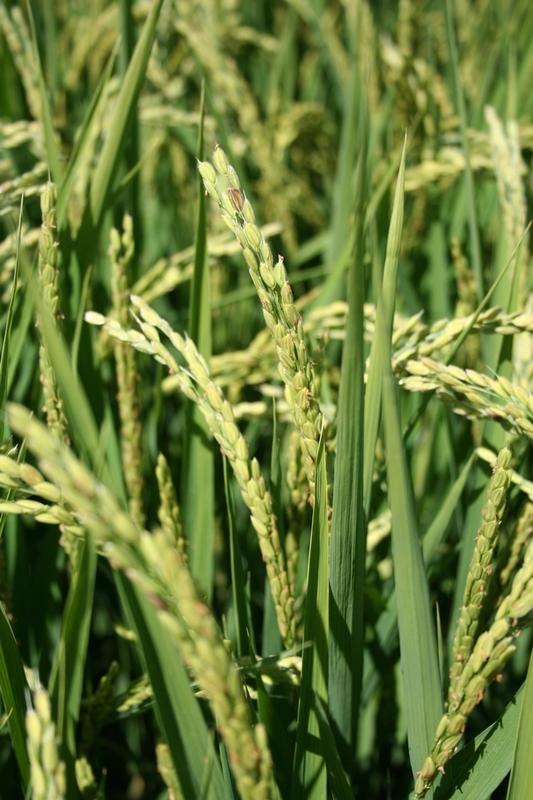 Yield components refer to the structures of the rice plant that directly translate into yield. These are: the number of panicles per given area, the number of spikelets (potential) grains per panicle, the percent of filled grains per panicle, and the weight of each grain. The number of panicles per unit area (we usually talk about panicles/ft2) is determined by the number of established seedlings and tillers produced per seedling. In general, 60 to 70 panicles/ft2 are needed to achieve good yields. How you get to this optimum number can vary. In a good stand (15 to 20 plants/ft2), plants will produce one to three tillers. In contrast, when the stand is poor (5 to 7 plants/ft2) plants may produce up to 12 tillers. The tillering capacity of rice plants help compensate for poor stands, but there is a price to be paid. When a lot of tillers per plant are produced, panicle maturity will be uneven, compromising grain quality at harvest. When stands are very dense, tillers may not even develop or may die before they can produce a panicle due to shading. Consequently only the main culm will produce a panicle. Other factors that can reduce tillering are nitrogen deficiency, weed competition and others pests and diseases. The number of grains per panicle is determined by variety and stand density. Most California varieties commonly produce 70 - 100 grains per panicle; the higher the plant density the lower the number of grains per panicle. The number of grains per panicle is set during panicle differentiation, about a week after the green ring stage. Thin stands will promote the production of more grains per panicle (and more tillers), but since there is a genetic limit to the number of grains per panicle, plants in fields with very thin stands might not be able to produce enough grains per panicle to compensate for low panicle densities. The percentage of filled grains per panicle can be affected by several factors. Empty grains, or blanks, can be the result of cold temperature during pollen formation (see the article “Water Management to Mitigate Blanking” in this newsletter). Later, temperatures above 104o F during flowering can dry the germinating pollen tube and cause blanking. Other factors that can reduce the percentage of filled grains are excess N, panicle blast and armyworms feeding on developing grains. Grain weight is relatively constant. It cannot be increased to compensate for poor tillering or small panicles. However, grain weight can be negatively affected by draining the field too soon before harvest. So how do these components relate to yield? Remember in large part, crop management affects only the first three variables. Ft2 and square meter are the same (units)？Could you explain what are kernel weight and 1000 grain weight mean? For the time being I do not have so much comment or questions. One square meter is 10.8 square foot. Kernel weight refers to the weight of each individual rice grain, and 1000 grain weight is the weight of 1000 grains, usually in grams. This can vary with grain type and size. I am responding to the question: Need your help in solving this. Given: Density/m2 = 260 Avg No. of filled grains per panicle = 136 Test weight of rice = 20 g Rice yield t/ha = ? I am assuming that the 20g test weight is the that 1000 grains weighs 20g. If that is the case the yield is 7070 kg/ha. The 260 panicles/m2 is low. In CA rice systems we would like to see about 700 panicles/m2 to maximize yields. The low number of panicles is somewhat compensated by having large panicles.